In another article, the song “Fix You” was specifically mentioned as being a copy of Elbow’s “Grace Under Pressure”. To that, guitarist Jonny Buckland had this to say. Since I don’t listen to the bands involved and can’t say if this is true plagiarism or just a case of them being “hevaily inspired by”, I can’t really pass any judgment. However, despite that and this not being a case of Internet plagiarism, it’s worth noting for several reasons. 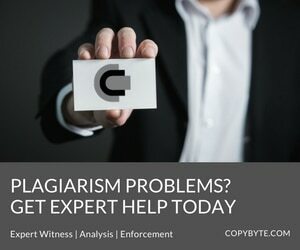 First is that it could indicate a shift in the views on plagiarism in the artistic community. Despite this very open admission and some very wide exposure regarding it, Coldplay has seen no backlash from its fans, from the bands that it “stole” from or the media. Second is that it might become a justification in other plagiarists minds. Personally, I wonder if the “Coldplay excuse” will become common, no matter how irrational or legally unfounded it might be. Finally, it shows just how deep plagiarism has worked its way into our artistic society when even the number one band admits to engaging in it. Those of us with original content and wish to protect it against misuse are facing something far more pervasive than previously imagined. After all, if Coldplay does, who else does? Previous articleBuying Your Way Out of Trouble?